Yimiton's Blog: Blue Ivy receives her first kiss from a boy! Blue Ivy receives her first kiss from a boy! 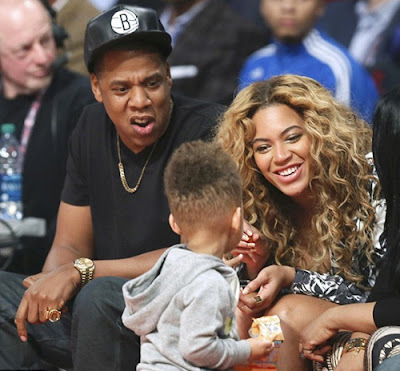 Alicia and Swizz Beatz's son, Egypt Daoud Dean, 2, kissed Blue Ivy, 1, the daughter of Jay Z and Beyonce and Jay. The dotting parents were quick to warn the 'Bad Boy's' dad. Here's what Alicia said on Wendy Williams Show; "I think Egypt kissed Blue and I don’t think Jay liked it very much. He told my husband, “Um, watch your son.